It hasn't been the funniest of weeks for Rugbydump, or even in the world of rugby, so we'll go back in time a little bit and revisit an amusing incident from earlier in the season, featuring that man Justin Marshall yet again. It was January of this year when the Ospreys and Gloucester met at Liberty Stadium in a Heineken Cup played in atrocious conditions. The crowd weren't phased though, and it was cheered on by an 18 000 strong contingent. Former All Black scrum half Marshall was everywhere on the night, putting in a well deserved Man of the Match performance as he marshalled (I couldn't resist) his troops to a 32-15 win. His brilliant counter attack run down the right wing set up Nikki Walker, who was stopped well by the covering defence. As Marshall went in to grab the ball, Gloucester flank Peter Buxton came in at the side and hit Marshall just as he was trying to gather the ball. The subsequent flamboyant Oscar-worthy dive resulted in Buxton being sent to the bin, looking rather angry and feeling hard done by. I don't blame him. It's funny to watch it now, but this kind of milking of a yellow card is poor. The dive, the hands waving in the air, it's all a bit cynical really. The good thing about a guy like Justin Marshall though, is that he knows it was outrageous, and he's willing to have a laugh at himself about it, as you can see during this short snippet from a European rugby chat show. Incidentally, Marshall has recently left the Ospreys, and will be playing for Montpelier in the French Top 14 this season. The league kicks off later this month, with big name players from all corners of the rugby globe being involved, making it one of the most exciting upcoming French seasons for many a year. On the move, Marshall said: “I have thoroughly enjoyed my time at the Ospreys and in many ways I will be sorry to leave, however, I believe the time is right to move on. “I’m now looking forward to my move to Montpellier and the very different challenges that playing rugby in France will offer. 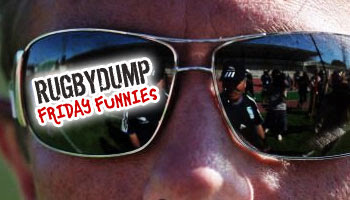 We'll keep an eye on Justin and his antics, and if any other award winning performances are to be put in, we'll be sure to feature them for you, right here on Rugbydump. I used to make fun of soccer player for that! Now i cant....Damn you Justin!!! it's too funny in slow motion...ha! OMG...that just confirms everything I ever felt for Marshall...pure disdain and utter contempt. what makes me angry is the commentary.... i guarantee you if lawson had taken a dive from ryan jones he would be up in arms, but no. can understand bias from supporters of the ballet dancer and wales in general, but not from a man there to give a straight opinion! Man that's funny. I reckon he owed Buxton a few bevies after the match! It's pretty bad though. Thank god we don't see that as a common thing on the rugger field. Hahaha. If it had been anyone else I would have been enraged, but I like Justin, a total and utter scrum half. I'm not even a AB fan. Half-backs are always the most amusing player on the field. He looked so sheepish afterwards. lol and I hope everyone who does that gets a ribbing cos they deserve it.